Develop your skills or test your current ones with this outdoor shooting package from Las Vegas. 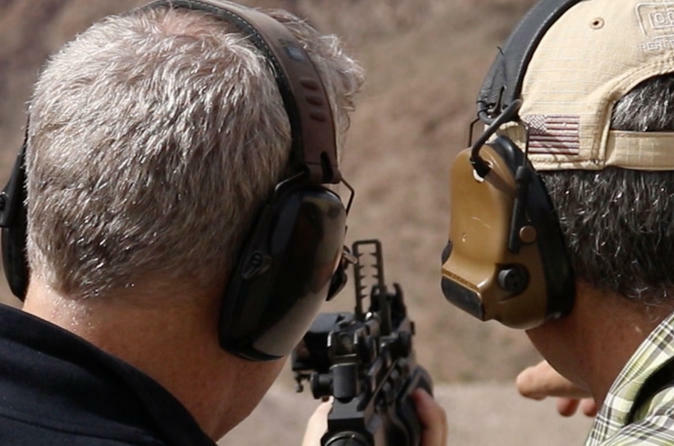 Spend a few hours out in the Mojave Desert with a professional instructor who will provide expert tips as you shoot a variety of guns such as MP5s, M4s, AK-47s and Desert Eagles. Choose from three different packages, all necessary equipment and round-trip transportation from Las Vegas is included. For an added level of adrenaline during your visit to Las Vegas opt for this outdoor shooting range experience. Perfect for all levels, you’ll be able to get your hands on some of the world’s most infamous guns. All necessary equipment including ammunition, professional instructor and round-trip transportation are included. This is a full-throttle, heart-pumping experience you’ll never forget. Instead of shooting off the standard issue pistol and a rifle, you’ll be getting your hands dirty with the Glock 17, MP5, and M4. Start your day off with a Beretta M9 handgun (10 rounds) and Remington 700 (5 rounds). You’ll then get into the meat of the experience with 25 rounds on a MP5, M4, and AK-47. By then, you’ll have run the gamut from handgun to big machine guns and everything in between. As a bonus, you’ll get to set up three exploding tannerite targets to take your experience to the next level. Feel the power of setting up your sight, squeezing the trigger, hitting your mark, and seeing the explosion scatter across the sand. If you want nothing less than the full spread of gun options, look no further. Start off light with the Desert Eagle and the Barrett. Before the pulse of the kickback has subsided, you’ll get to be acquainted with the M60, M4 and AK-47. To step up the thrill-factor you’ll get to aim at 4 tannerite exploding targets so you can feel the full force of the formidable guns you’ll be handling! Please note: minimum age is 18 years with valid ID.